The pico de gallo salsa is a perfect preparation to make good use of almost any fresh ingredient that we have in the fridge. With a base of tomato, onion and chili – the possible combinations are almost limitless. In this recipe mandarin is added that gives a sweet and citrus exquisite flavor, which counters with the freshness of the cucumber and the jicama (other very interesting ingredients that are used in the recipe). In this way the mandarin pico de gallo fills of unique flavors and textures. It is a perfect recipe to accompany a grilled fish , a grilled chicken breast or almost any dish with pork. But it can also serve us as snack next to some garlic shrimps. 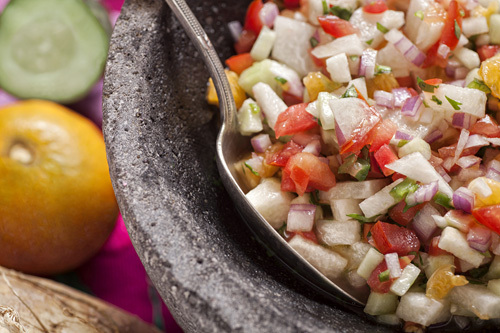 To make the pico de gallo you are only going to work a bit but everything is easy to make. The mandarin has to be cut in a very special way, we recommend using a small and sharp knife. The mandarin is a winter fruit therefore from November to February is the best time to prepare the salsa. Use extra virgin olive oil so the salsa will have a better flavor. With this recipe you will get 2 cups. Finely chop 1 serrano pepper and 1 coriander sprig; then pass them to the bowl and reserve. If you want a less spicy pico de gallo, remove the seeds and the veins of the serrano pepper. Peel 1/4 of a jicama. Dice the jicama that was peeled, put them in the bowl and reserve. Peel 1/2 cucumber, cut it lengthwise and remove its seeds. Dice the cucumber with the one you worked, put them in the bowl and reserve. Peel 1 mandarin, making sure of removing the pith, then separate the segments. Remove the skin and the seeds of the mandarin segments that were separated. Cut into small chunks the mandarin segments with the ones you worked and put them in the bowl with the other ingredients; then set aside. Pour the dressing that was beaten in the bowl over the other bowl, where the mandarin pico de gallo is. Mix very well the mandarin pico de gallo with a mixing spatula. Recommendation: If you put some lettuce leaves to this salsa it will transform into a healthy and exquisite salad. Variation: The pico de gallo can also be prepared with tomatillo. Did you like the Mandarin Pico de Gallo? Put the pico de gallo in this bowl so it will be fresher. If you don’t have jicama to make the recipe you can buy it here. This small and sharp knife is perfect to cut the mandarin in a precise way.